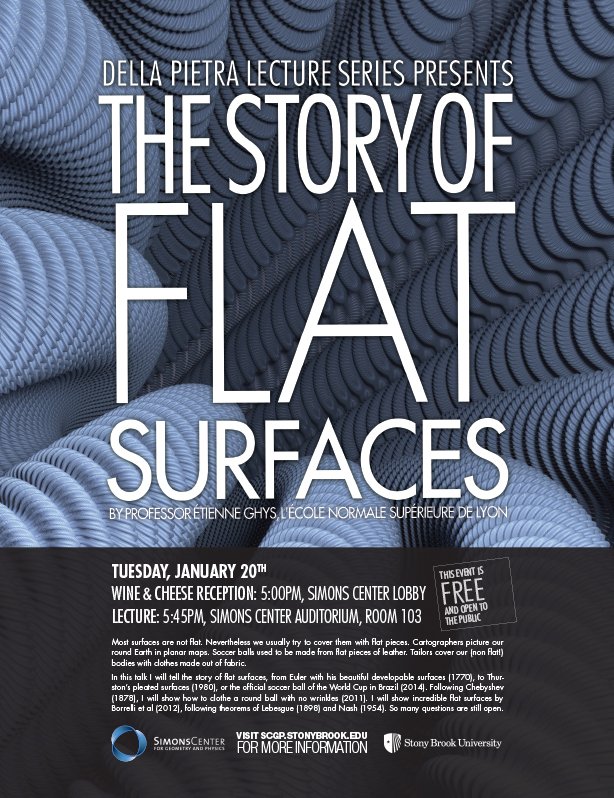 Most surfaces are not flat. Nevertheless we usually try to cover them with flat pieces. Cartographers picture our round Earth in planar maps. Soccer balls used to be made from flat pieces of leather. Tailors cover our (non flat!) bodies with clothes made out of fabric. 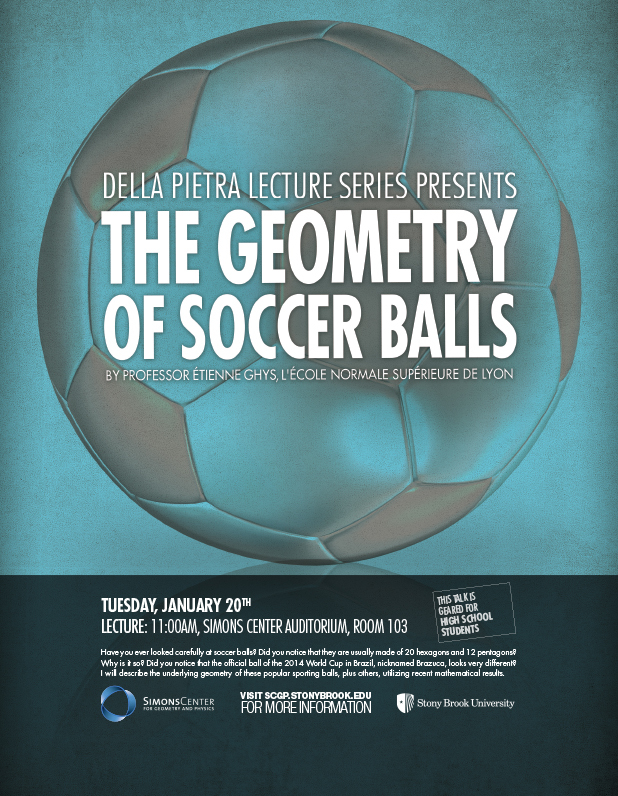 In this talk I will tell the story of flat surfaces, from Euler with his beautiful developable surfaces (1770), to Thurston’s pleated surfaces (1980), or the official soccer ball of the World Cup in Brazil (2014). Following Chebyshev (1878), I will show how to clothe a round ball with no wrinkles (2011). I will show incredible flat surfaces by Borrelli et al (2012), following theorems of Lebesgue (1898) and Nash (1954). So many questions are still open. Abstract: Have you ever looked carefully at soccer balls? Did you notice that they are usually made of 20 hexagons and 12 pentagons? Why is it so ? Did you notice that the official ball of the 2014 World Cup in Brazil, nicknamed Brazuca, looks very different? I will describe the underlying geometry of these popular sporting balls, plus others, utilizing recent mathematical results. This talk will consist of two independent parts. In the first part (intersecting curves), I would like to elaborate on a clever observation of M. Kontsevich. When a collection of real analytic planar curves meet in some point, some prior conceivable topological pictures turn out to be impossible. 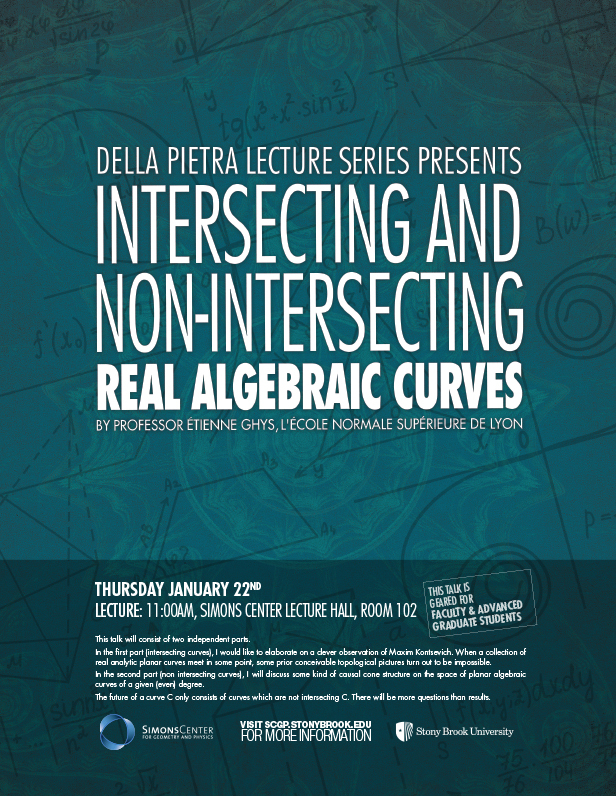 In the second part (non intersecting curves), I will discuss some kind of causal cone structure on the space of planar algebraic curves of a given (even) degree. The « future » of a curve C only consists of curves which are not intersecting C.
There will be more questions than results. Étienne Ghys is a French mathematician. His research focuses mainly on geometry and dynamical systems, though his mathematical interests are broad. He also expresses much interest in the historical development of mathematical ideas, especially the contribution of Henri Poincaré. He co-authored the computer graphics mathematical movie Dimensions: A walk through mathematics! Alumnus of the École normale supérieure de Saint-Cloud, he is currently a CNRS “directeur de recherche” at the École normale supérieure in Lyon as well as a member of the French Academy of Sciences.